U.S. 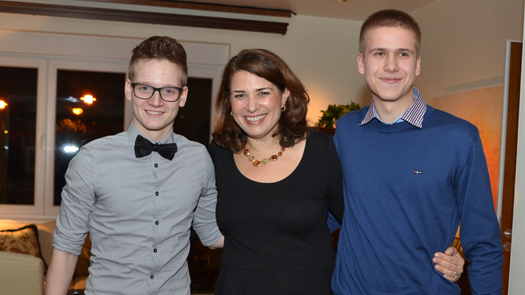 Ambassador to Croatia Julieta Valls Noyes (center) poses with two video contest winners during a reception to celebrate the Croatian video teams. Mario Bajkusa and Mihajlo Delic, two International Visitor Leadership Program (IVLP) alumni from Croatia and Serbia respectively, helped develop and implement the project “Integrity: It Starts with Me” which aimed to engage Croatian and Serbian youth in the battle against corruption. The project was supported by both the U.S. Embassies in Zagreb and in Belgrade, and received funding from the State Department in Washington, DC. The program kicked off in July, 2015 with a five-day workshop in Croatia for educators and students from both countries. The educators learned techniques to stimulate discussion with their students about identifying and combating corruption in daily life, while the students worked with a U.S. speaker on drafting academic honesty codes. Participants met again in Belgrade in December to discuss how they had used the tools and knowledge from the July workshop in their classrooms, schools, and communities. The educators had developed projects such as using drama-based instruction techniques (role-playing, creating tableaux, etc.) as a gateway for discussion with their students; polling their students about their attitudes towards cheating and corruption; holding discussion groups and working with their students to create anti-corruption videos. The students were equally active and creative, presenting to their peers in the classroom and at youth centers, researching teachers’ and students’ attitudes towards cheating, and instituting honor codes at their own schools. Both educators and students discussed plans for future presentations, workshops, and engaging other schools in the fight against corruption. The third element of the program was an anti-corruption video contest for high school students in both countries called Zelim Drugacije (I want something different). The contest received over 50 entries from Croatian and Serbian junior high and high school students through the project’s Facebook page. The jury selected the three videos (listed below) as the winners for their creativity and positive messages. The Zelim Drugacije Facebook page has 3,700 followers, which ensured a wide audience for the videos. The U.S. Ambassador to Croatia hosted a reception on January 12, 2016 to award prizes to the two Croatian teams and to meet some of the Croatian students and teachers who participated in the July and December workshops. IVLP alumni Mario and Mihajlo played key roles in designing and implementing the project, helping to shape the workshops in July and December and serving as mentors throughout the program.